Our dearest ‘Ruby’ is a teacher by day! She goes by the super hero name ‘Ms. Packnett’ in her classroom! She loves when Valentine’s Day comes each year and her class gets to celebrate together. This year, Ms. Packnett has a few students in her class who have special dietary restrictions. Celebrating with traditional candy and sweet treats isn’t an option this year. So we set out to create a special Valentine for Ms. Packnett’s second grade class! 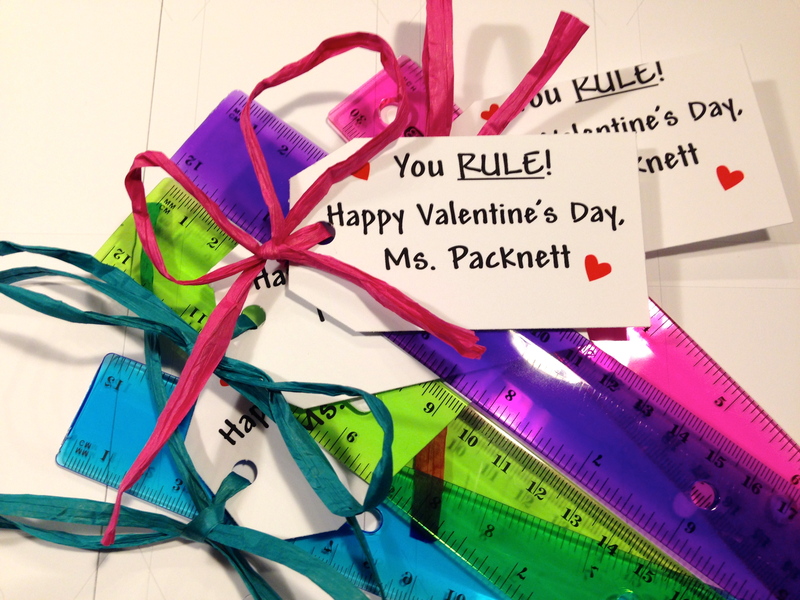 We decided the Valentine needed an educational theme, and tied “You Rule” notes onto colorful rulers for each student. The project was simple, affordable, and quite frankly, adorable! Now each child has a tool they need and can use in class, and no one is left out! As long as Ms. Packnett stresses that the rulers are NOT weapons, it should be a great Valentine’s Day! Many people see Valentine’s Day as a commercial driven ‘holiday’. While that may be true, remember that Valentine’s Day is really about being thoughtful! Whether you’re buying extravagant gifts for your loved one, or treating yourself to a massage, you can always do a little something for someone today (even yourself). See past the commercialization, and think like Ms. Packnett! She created a little something with true intention and thoughtfulness! Our dear friend, Sharyn, reminded us of a quote from comedian Jim Gaffigan…”Without Valentine’s Day, February would be… well, January!”. So mix it up today! Treat the person behind you at Starbucks. You know they’ll LOVE that, and the giving spirit will be contagious! This is a wonderful way to celebrate – love thinking outside the “candy” box! Love this idea! Very creative ladies! Woohoo! I got a shout-out! Happy Valentine’s Day, sweet friends. PreviousTell Us What You Want!